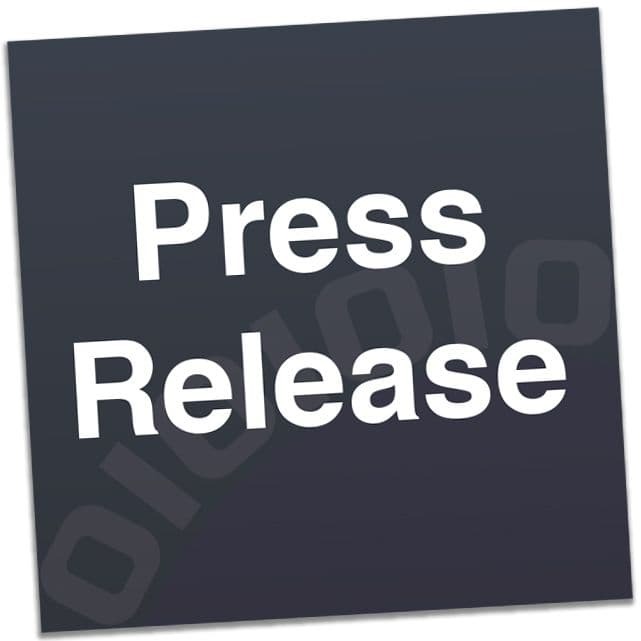 Taipei, Taiwan – Cooler Master, a leader in design and manufacturing computer components and peripherals, today announced the launch of a new model in its modular MasterCase line. The Pro 6 is the discreetly designed mid-tower cousin of the award-winning Pro 5 case, and it comes with the same FreeForm™ Modular System that allows multiple exterior and interior layouts. What makes the MasterCase Pro 6 immediately stand out from the rest of the MasterCase series is its flush look. The top, front and back panels are all seamlessly merged by smooth, flush panels in dark metallic grey. The front is marked by a soft LED glow emerging from the bottom. Even the I/O panel is hidden by a cover that blends into the top panel. Cooler Master thinks the minimalistic design is a more subtle approach to home, gaming and office setups, more about blending in and complementing your existing décor rather than standing out. 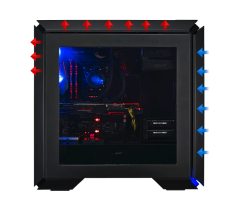 For those concerned about the typically subpar airflow of cases with a flush design, Cooler Master has added an interesting “pop.” In addition to the thin vents on the four corners of the case that provide ventilation, the top and front panels can be popped open with a two-tier magnetic paneling system that creates little vents, lining the space between the panels and the frame. Versatile liquid cooling is also another cooling option, with a water cooling bracket that allows 297mm radiator space on top, or front installation by shifting the bottom HDD cage. 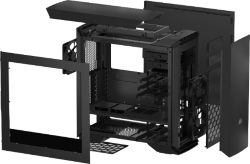 The case offers a convenient layout with a huge amount of freedom, due to its highly adjustable frame and easily removable parts. There are two pockets with four mounting positions for SSDs, and there is an interior partition panel that isolates the power supply and cables for clean management. Our unique clip-and-click panel for drive cage adjustment also comes straight from our FreeForm™ technology. If you have a lot of ideas about what you want inside of your case, the FreeForm™ Modular System should provide plenty of options. The FreeForm™ concept draws from Cooler Master’s quest to design a completely modular case. With it, you can easily move or remove drive cages, mount SSDs in four different locations, install large liquid cooling radiators and graphics cards, and keep your cables clean and hidden. For its full potential, visit Cooler Master’s FreeForm™ website. Further customize your MasterCase Pro 6 with an ever-growing range of accessories created by Cooler Master's design team and its “Makers.” As this ecosystem fills out, the options to really put together an altogether unique look and layout become more possible, with the idea of swapping and upgrading through the years, rather than buying all new equipment every time technology moves forward. Check out the full range of Maker Made or FreeForm™ Accessories here. 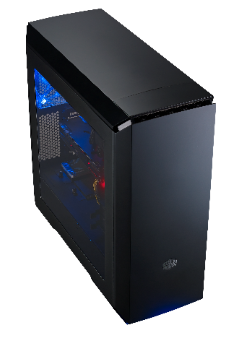 The MasterCase Pro 6 will be available in 2 options –Blue LED fan and lighting or Red LED fan and lighting. It is expected to be available at local retailers in Europe by the end of February 2017, for a suggested retail price of £139.99 respectively. Reviews for this fantastic case will be launched on the 14th February. Keep your eyes peeled!